The cover for Ultimate G’s boasts that it features Michael Cera, and since most IMAX features are of the documentary type, it’s logical to expect he’s narrating this thing. Those that are paying attention will realize this feature is from 2000, and Cera was all of 12 when this was filmed… and it has a full-on narrative. Granted, the narrative is sluggish, painfully acted, and as cliched as any script ever written, but it does have one. That means it’s low on informational value, the whole concept of flight contained to one scene, so simple it only requires a piece of paper. See, anyone can do it! Ultimate G’s is obviously something a little different than the IMAX norm, and while it fails miserably almost everywhere else, it’s a total success in the air. The flight scenes that dominate the back-end of this one are spectacular, a camera strapped to the front of the planes as they graze the Grand Canyon. 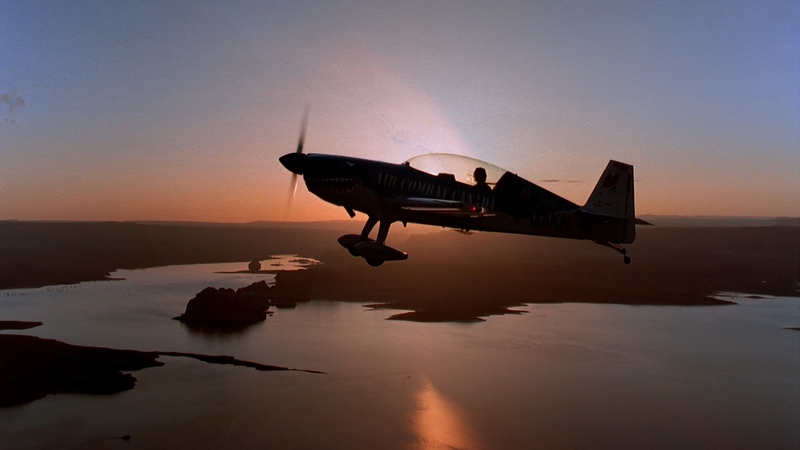 Flips and turns are all captured in stunning clarity, and the exterior shots of the planes buzzing through the air are captured with the same artistry. At a mere 37-minutes (more like 35 if you don’t consider book-end credits), it’s a shame there’s not more of the same material. There had to be additional footage available to fill in gaps to keep these “actors” off-screen longer, and a simply hilarious, clunky romance out of the script. Whatever emotion is generated from the sense of speed and flight is completely lost once someone opens their mouths, and that happens far too often. Note: Doblu is not yet equipped with 3D equipment, so this review is based on the 2D version only. It’s possible Image is dealing with a dated master here, which would explain the rather sub-par image quality. The detail simply isn’t there like it should be for a 70mm affair, and the rather odd glaze of static grain is questionable. As far as the AVC encode goes, compression problems are non-existent, so the transition to disc doesn’t seem to be at fault. Since most of the film is dealing with kids trying to build flying machines or the pathetic narrative (complete with painfully stiff direction), that’s not going to deliver the eye-popping images expected for a Blu-ray release. Instead, it’s all slightly fuzzy and flat, the only highlight being the planes themselves. They’re painted a brilliant red and blue, the primaries carrying intense saturation and purity. In the air, things are better, the Canyon astonishing in its beauty. The rather limited visual fidelity here cannot defeat the intensity of these rock formations, or the views they’re presented in. There’s even a hint of ghosting at times, still not enough to knock the purity of these images off course. Unlike many down conversions from IMAX, there are no instances of halos, and that rather suspicious grain structure hides that digital, smooth-skinned look, albeit poorly. Black levels are fine and the contrast spot on. This is a showy DTS-HD mix, one of those that does everything it can to create surround effects. That means it’s pleasing and accurate, if at times somewhat overdone. The credits are introduced by letters flying towards the screen, each creating a “whoosh” effect as it passes. A model plane buzzes around the frame until it comes to rest properly in the fronts. People talk off-screen, their voices placed into the appropriate surround. As you should probably expect, the eventual jet racing is spectacular too, engine sounds placed into the right channel dependent on camera positions, and side-to-side pans show how well the stereos are being utilized. The score is also outstanding, far better than the material would suggest. It aggressively pursues the surrounds, the full wrap-around effect exquisite. Dialogue is the one fault, likely dubbed over entirely due to the well publicized noise IMAX cameras create. It’s obviously elevated above its natural levels, although not in any way that’s offensive. It’s still tolerable. The only extras are trailers and BD-Live support. Aww… no Michael Cera commentary?